The Messages from Your Angels oracle card deck makes it easier than ever to give an amazingly accurate angel reading for yourself or others. Each card features a gorgeous angel painting, along with a one- or two-sentence message. These cards will help you and others know what your exact life purpose is, whether or not somebody is your soul mate, what to do about your job and living situations, and other important life questions. 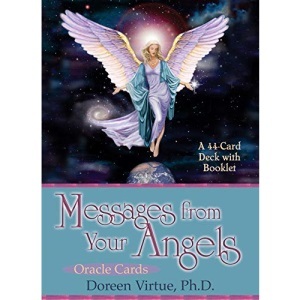 Doreen Virtue based these cards upon her actual angel readings, using the most commonly asked questions and angelic answers to create the ultimate deck for both the beginner and the advanced oracle card reader.